Have we gone from the Worst of Times to the Best of Times in just seven weeks? It truly has been a Tale of Two Markets during the past couple of months. The S&P 500 declined -9.2% in December, a year-end performance not seen since 1931. And after the Christmas Eve massacre (December 24th), less than two percent of stocks within the index were trading above their ten week (50-day) moving average. That’s an astonishingly low reading. So it's hardly a surprise that a major bottom was put in. January on the other hand was the mirror opposite, as a strong recovery sent the S&P 500 up +7.9% -- the best monthly start to a calendar year since 1987. In the weeks since those December lows, the S&P 500 has gained more than 16%. Quite impressive. Even more impressive is that more than 84% of the stocks in the index are now trading above their 50-day moving average. That’s the highest reading in three years – since July 2016. 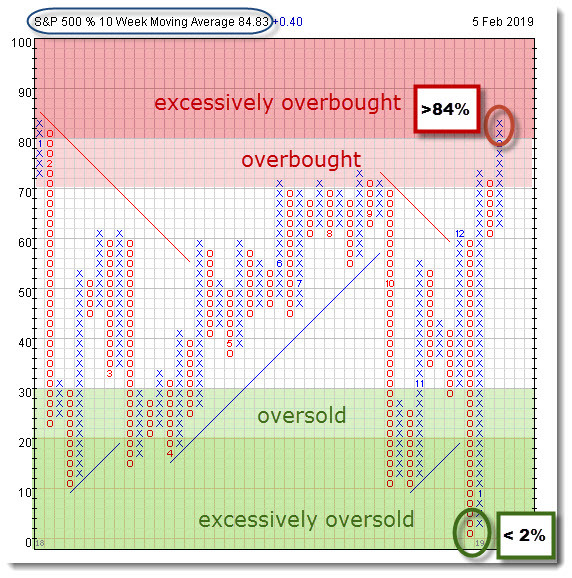 In other words, in a near eye-blink we’ve gone from excessively oversold to excessively overbought. And I assure you that the Polar Vortex has nothing to do with it! Typically when this indicator hits such an extreme reading, odds of a corrective action increase dramatically. And since the reading is now overbought, the stock market rally may soon hit the pause button. 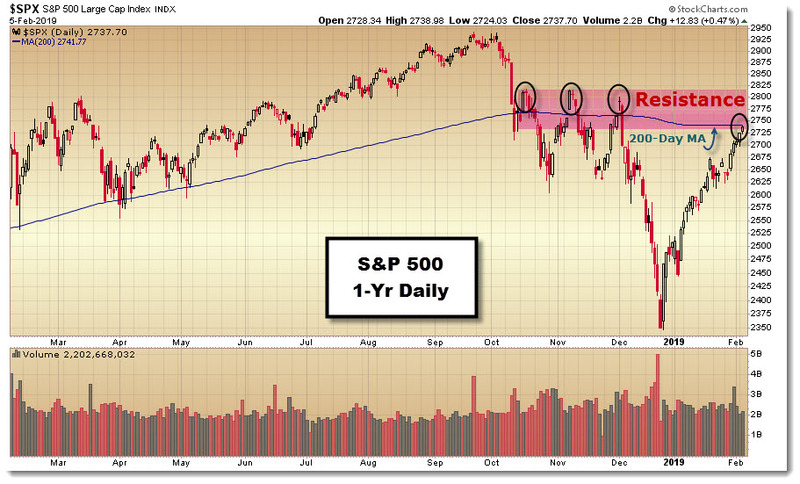 Especially in light of the fact that the S&P 500 is bumping up against a formidable area of technical resistance. If you have a look at the daily price chart on the S&P 500, you’ll find that the index is now approaching the 200-day moving average. And just above that key point you run smack into the triple-top failure from the fourth quarter 2018 correction (the dark circles on the chart). In other words, the bulls have a rendezvous with a heavy dose of supply. The easy gains have already been made, but the next three percent or so from here is going to be heavy lifting, until all that excess supply that fueled the correction is absorbed. The good news is that many stocks have rebounded sharply from their late-December lows. Some are even at or near their previous all-time highs. With the forgoing in mind, investors can apply an options strategy that can enhance returns, generate cash income and create a limited hedge. I’m referring to the Covered Call strategy. 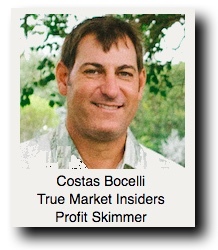 This strategy entails selling out-of-the-money Call options against stocks you already own. You’ll want to sell one Call option contract for every 100 shares of stock held. And since an option’s premium decays fastest within the last 30-days, it’s ideal to sell Call options with about one-month to go until they expire. Salesforce.Com (CRM) has made a huge run off of its correction lows and is now approaching its prior highs. 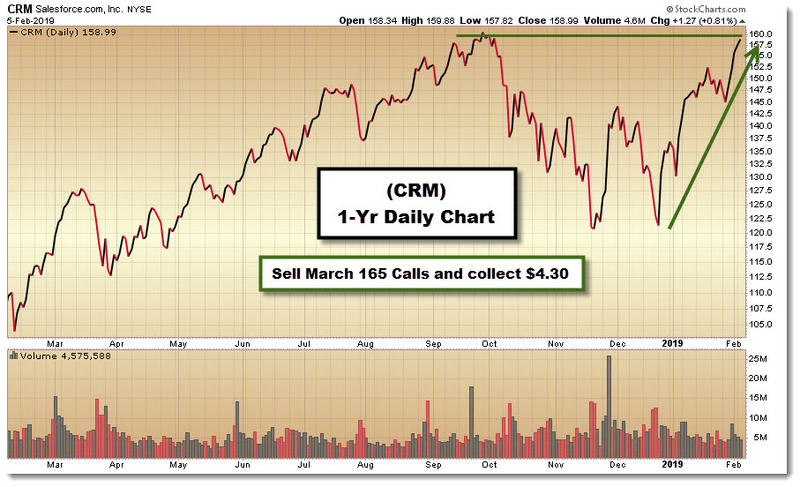 CRM could be considered a good candidate for selling out-of-the-money Call options to generate income. The premium collected from selling the Calls essentially reduces the cost basis of the stock, and provides a limited downside hedge. With CRM recently trading $159.00, you could look to sell the March 165 Call option and collect $4.30, or $430 for every 100 shares of stock. The premium is instantly deposited as cash into your brokerage account and is yours to keep. The Calls expire in 37 days and equate to a 27% annualized return. And since the Calls are six points out-of-the-money, there is additional room for further capital appreciation. In other words, if CRM trades higher, sideways or even modestly lower over the next month, you’ve made your stock and your money work harder for you. Selling Covered Calls after a stock (or the broad market) has made a big run and, in particular, is now up against formidable resistance can be a very smart, effective strategy. Other stocks that have similar setups and may be suitable for the Covered Call strategy include: MasterCard (MA), PayPal (PYPL), Autodesk (ADSK), Starbucks (SBUX), Oracle (ORCL), O’Reilly Automotive (ORLY) and Dollar General (DG). If you’re interested in learning more about selling Covered Calls and other ways to generate income with options, you’ll want to check out Options Soup, our options educational program. It was designed to teach the greenest investor everything she needs to know about options in an easy to understand format. Give us a call at 855-822-0269 and ask to reserve a seat.